It’s Bee Time! Long waited spring is around the corner! We will soon see swarming bees coming out from hybernation. Painting bees with the food plants has been one of my favorite subjects. In April, we will have fun painting them in my Tuesday day Watercolor Class. If you want to join, contact me. Bee, Dandelions and Violets. ©Heeyoung Kim. 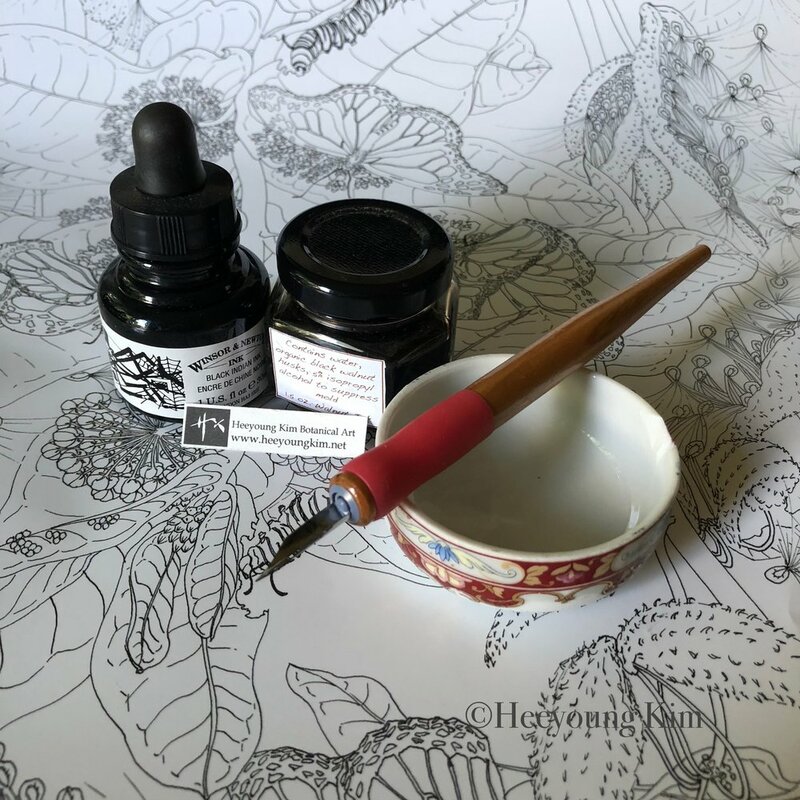 While convenient mechanical pens or pigment liners are available, learn why master artists like Heeyoung Kim find magic and value in using the old style of crow quill pen and ink. Crow quill pens are valued for their ability to create the finest, hair-like lines and detail in addition to being an affordable material. This workshop will explore how to implement the best techniques for stippling and line drawing using crow quill pens. You’ll learn how to achieve various weights of line through pressure and speed and create new effects through volume. Students will be taught how to introduce sepia color to their artwork and work on Bristol board with clean finishes. We’ll enjoy time in the gardens harvesting fresh plant materials to study. 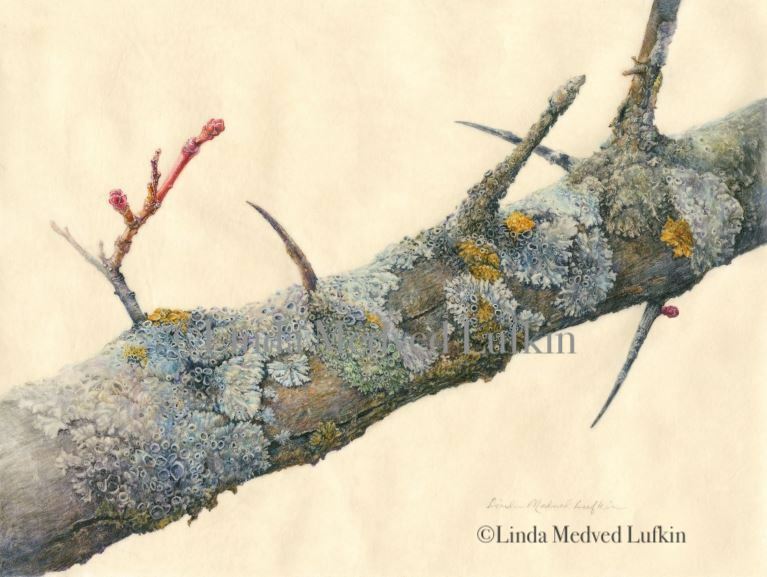 Workshop description: The subtle colors in lichens and mosses on branches make an excellent subject for watercolor. Strengthen your observation, rendering, wet-in-wet and dry brush techniques; as well as your color-mixing skill while we focus on drawing lichens and moss accurately and creating a dynamic composition with emphasis placed on creating maximum dimension. You will be given a presentation to help you understand the botany of the lichen and moss subjects that you will be painting. This class will focus on expression of form, structure, and color. Additional information will be given on how and when to use Ox Gall, Lifting Aid and Gum Arabique to widen your watercolor skill set. Instructor’s bio: Linda Medved Lufkin is an instructor at the Minnesota School of Botanical Art. Her work has been shown at the ASBA/Horticultural Society 20th & 19th Annual International exhibition and was awarded The Richmond & Lily Bates Award and The Helen Gray Garber Award, respectively, and the ASBA 2015 Small Works exhibit where she received an Honorable Mention Award. She has works in the Eloise Butler Wildflower Garden Florilegium Minneapolis, MN. Fee: $365 for current students and Brushwood Center members. $375 for others. If you are the one who always wanted to draw/paint, but you didn't think you could. Now, it is the time to try! If you are lucky :) to live in Chicago Metropolitan Area, contact me to see if starting to learn how to draw is a possibility to you in the new year. 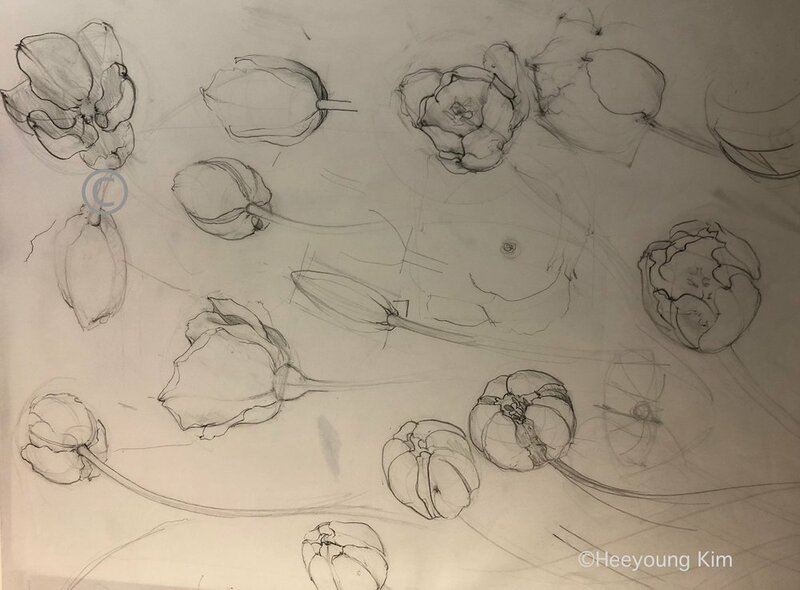 The very basics and a lot of tips about how to use drawing tools will be covered, along with essential botany information for botanical artists. So, there is no need to feel intimidated in my class. at Brushwood Center at Ryerson Woods. For registration, contact Heeyoung. Technique focused botanical watercolor class for beginning/early intermediate level. Through demonstration by the instructor, students learn and practice essential watercolor techniques step by step. For question about registration, contact Heeyoung. Registration time is flexible. Opening Reception: November 4, 1 pm - 3 pm, 2018, at Brushwood Cetner. This annual exhibition has become a celebration for art, nature and Brushwood mission as well as each artist's achievement. 78 artworks in watercolor, ink, and graphite by 25 artists will be displayed all over the beautifully renovated historical house built in 1942 as a summer house for Edward L. Ryerson family. Year by year the Brushwood annual botanical exhibit charms locals with the beauty of the ancient art form. Septemge 29 & 30, 9:30 am - 4:00 pm, 2018. A two days workshop with focus on techniques. 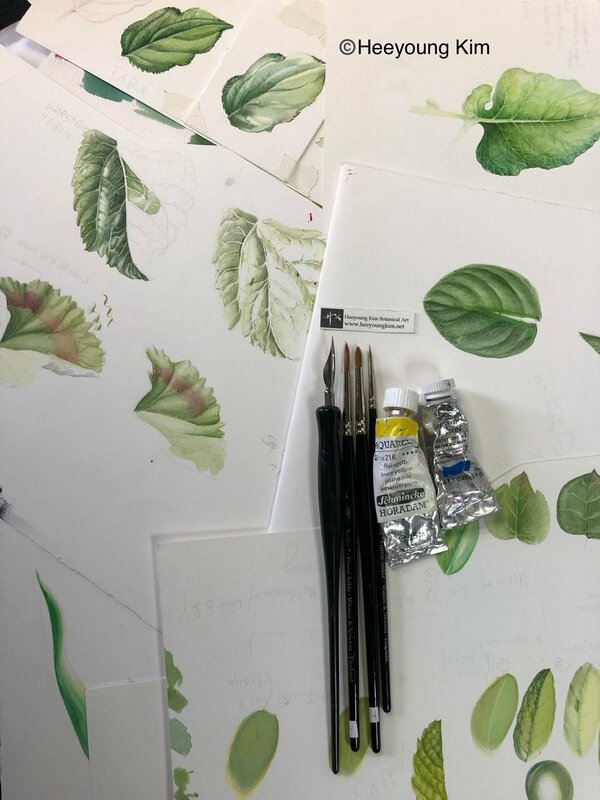 Either for a beginner or those with some watercolor experices, this will be a good chance to improve painting skills, especially with gren leaves in botancials. For registration, contact Heeyoung. At the moment, the class is full, but contact me to be in the waiting list or for additional workshop in the future. Two Mondays: September 17 & 24, 2018. 10 am - 4 pm. There is something magical in old style pen nib and a bottle of ink, while convenient michanical pens or pigment lingers are available. 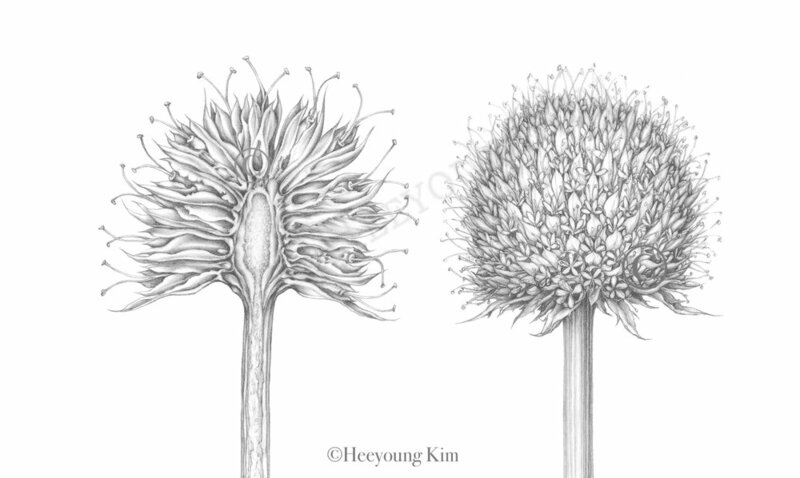 Heeyoung Kim uses crow quill pen nibs for her fine botanical illustrations, and she will teach how to use them in this two days workshop. $85 per session. For registraion, contact Heeyoung. September 17 & 22, 9 am - 1 pm, 2018. This workshop is designed to meet demand on ink illustration for those who cannot make Mondays. Similar contents will be taught with some reduction due to the time limit. For registration, contact Heeyoung. $57 per session. This one year program is designed by Heeyoung Kim for beginners. Studetns will start from Drawing Fundamentals 1, 2, 3 & 4, and continue with Watercolor Botanical 1, 2 & 3. Each class is focused on techniques and demonstrations by the instructor, and each students can receive lots of one on one guidance during the class. After finishing the program students can move on to either a half day workshop on Saturdays or a full day workshops on Mondays to continue to pursue boanical art and illustration. $215 for a course of 5 weeks. For registration, contact Heeyoung. Monday open workshops are designed and taught by Heeyoung Kim for those who finished courses for beginners and/or intermediate level with her, and continue to hone their painting skills with her personal assistance. Students are encouraged to choose and study their own specimens with long term goals. This class will continure in 2019. Sketch or color summer flowers at urban oasis, Lurie Garden at Millenium Park. 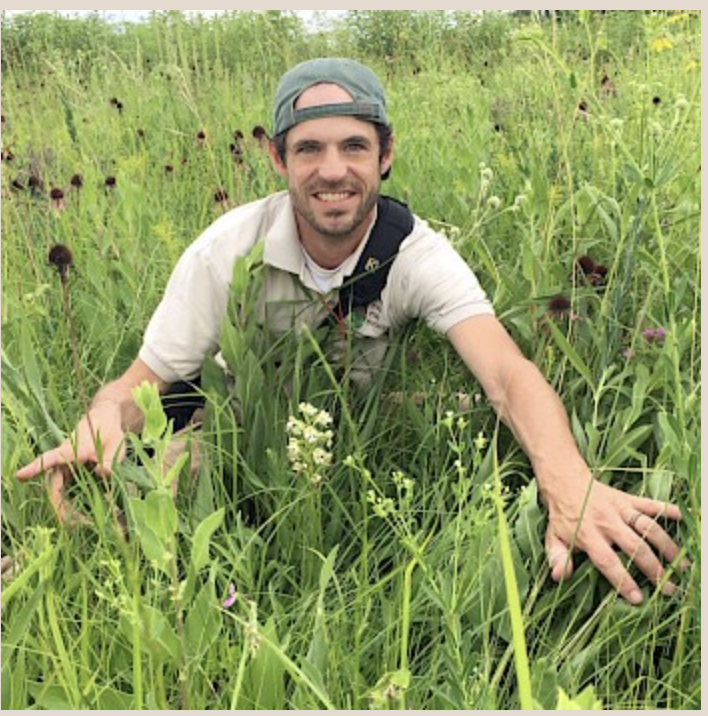 Lurie Garden is designed by renowned landscape designer, Piet Oudolf and it provides various programs sponsored by the city of Chicago. Heeyoung Kim is one of a few invited artists and Chicago citizens can enjoy outdoor sketch with her guidance. For registration, contact Heeyoung.